Examples, solutions, videos, worksheets, stories and songs to help Grade 5 students learn how to calculate the percent of a number. 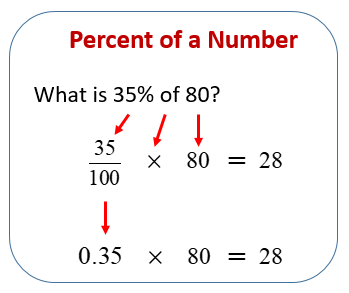 The following example shows how to find the percent of a number. Scroll down the page for more examples and solutions. Learn how to find the percent of a number using the fraction form or percent form. How to find the percent of a number? How to calculate percentages mentally using this cool math trick?